Almost every homeowner has to deal with mice at some point. Mice don't make exceptional houseguests; they leave droppings behind and occasionally chew through walls and food boxes. Traditional mechanisms for capturing mice don’t treat the critters very well, with most relying on lethal methods. If you’d like to get rid of the mice in your home but don’t want to harm the little fellas, you have a few solutions at your disposal. Remove the food sources for mice from your home. Exposed food items and crumbs make excellent snacks for mice, and cardboard containers don’t stand a chance against their sharp teeth. Store food in airtight plastic containers and conduct a thorough cleaning of your cabinets to ensure everything is clean and sealed. Inspect the exterior of your home and caulk up any holes or cracks you find. Mice don’t usually use the front door, so you’ll need to lock off their usual points of entry. Place humane mousetraps in areas frequented by your unwanted guests. Humane traps lure mice into a small box, and then snap shut when the mouse is safely inside. You’ll need to release the mouse somewhere outside after he’s trapped. Soak cotton balls in peppermint oil and leave them in areas visited by mice. There is no guaranteed mouse repellant, but mice seem to dislike peppermint oil. You can also place mint plants near your home’s foundation. Talk to a professional exterminator if your mouse problem continues unabated. 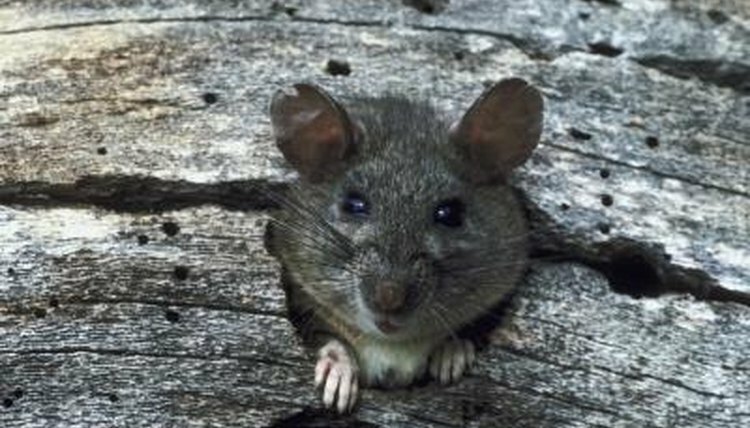 Some services offer humane solutions for homeowners with extreme mouse infestations.  Remember to seal off grass seed and pet food when you’re mouse-proofing your home.